In November, Jean Lesage International Airport in Quebec City (YQB) opened a new international terminal that will double the size of the infrastructure in the hopes of attracting more flights. But that could be a challenge, since the airport still doesn’t offer public transport to the city and a lot of local residents prefer to fly out of Montreal. Having an ultramodern airport will attract a lot of curiosity, a lot of interest, more travellers and more airlines, said Quebec premier Philippe Couillard at the building’s inauguration. That could be wishful thinking. Despite doubling the number of passengers using the airport in the last 10 year to 1.6 million, it was only the 12th busiest airport in Canada in 2016, behind Kelowna which served 1.7 million travellers. And Kelowna only has a population of 195,000 versus 530,000 for Quebec. The situation creates a vicious circle. Without a critical mass, airlines won’t be attracted to the airport, forcing travellers to look elsewhere. The new international terminal cost $277 million to build, so the airport wants to cash in on the growing demand for global air travel which is expected to triple in the next 15 years, from seven billion to 20 billion travellers, noted Gaetan Gagne, president and CEO of Aeroport de Quebec. And those that aren’t ready will miss out on the economic spinoffs, he added. A recent economic impact study by the Conference Board of Canada estimated YQB contributes $628 million to Canada’s GDP and supports close to 6,000 Canadian jobs. Gagne estimates that 1.3 million passengers from other regions of the province are lost to Pierre Elliott Trudeau Airport each year instead of using his airport. Quebec City mayor Regis Labeaume wants to create a committee to figure out how to increase airline traffic, since a lot of flights to the U.S. have been lost over the past few years. He notes the city has an unemployment rate of just four per cent, 25 years of economic growth, an exceptional year for tourism, yet the number of flights to the U.S. keeps diminishing, which is not normal. But by the end of 2019, the airport will have invested $500 million on infrastructure upgrades, including the new terminal which will allow YQB to offer more flights to other international destinations, including Europe and the Caribbean, noted Gagné, who added that the airport is experiencing annual passenger growth of 6.5 per cent, the highest in Canada. And with a large convention centre, major corporations, several large insurance companies and Laval University research programs, business travel now accounts for 40 per cent of YQB’s clientele. There is also the city’s growing port, Quebec Winter Carnival, summer festivals, its famed walled city, its designation as a UNESCO World Heritage Site and a new Club Med that will open in 2020, which will also drive growth. Infrastructure spending includes two major terminal expansions, a new five-storey parkade for 1,150 cars, revamping the airport’s two runways and new snow removal equipment. The airport also expects to begin construction of a new U.S. Customs preclearance facility in the spring of 2019. The new international terminal adds four gates and includes features like self-service technologies, larger and more efficient security screening facilities, a larger international arrivals hall and new primary inspection kiosks for customs to reduce waiting times for passengers. About 10 years ago, the airport launched a program called Le passager avant tout (Passenger First), believing satisfied passengers would boost the airport’s bottom line. After all, without passengers, none of the airport’s other major stakeholders would last very long, Gagne reasoned. As part of the program, airport employees are empowered to be proactive if it helps passengers have a better airport experience. Quebec is the only capital with a population of 500,000 or more that doesn’t have public transport to the airport. If travellers don’t want to pay $35 for a taxi, they have to walk close to 25 minutes to the airport from the nearest bus stop. “The Capital Transportation Network receives a number of complaints, including from tourists, who do not come back to such a cheap welcome in Quebec City,” says Etienne Grandmont, general manager of Acces Transports Viable. “While Quebec has a very positive image among tourists, this (transit) aspect is lacking.” Gagne says he is aware of this shortcoming, but says le Reseau de Transport de la Capitale expects to have bus service to the airport by 2020. On a more positive note, YQB will be showcasing its plans for the future when it hosts the annual Routes Americas aviation forum in February, 2019, the first time the event will be held in Canada. Routes Americas brings together airports, airlines, tourism authorities and governments to plan future air services. The YQB event is expected to attract 80 airlines, 300 airports and over 1,000 delegates. “This is one of the aviation industry’s biggest and most prestigious events. 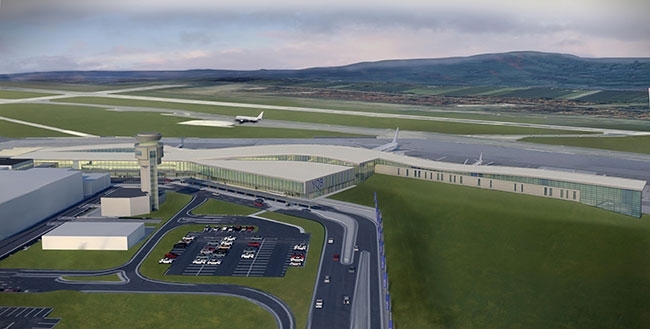 Hosting it will certainly help Quebec City Jean Lesage International Airport to position its air services and to improve the visibility and profile of the destination within North America,” said Gagne. “It’s a unique opportunity to take a group of influential players from the global aviation industry and show them everything the Quebec City region has to offer.